Technology today is changing our everyday lives. Many people, however, aren't aware that technology is also impacting dentistry in new and exciting ways. Cutting-edge innovations in dental instruments are requiring less time in the dental chair, causing less discomfort and creating satisfying results. We are proud to offer in our office some of the latest innovations in dental technology today. Laser dentistry is one of the most exciting advances in dental technology today. The DEKA UltraSpeed CO2 laser allows us to offer the ultimate in soft tissue treatments. Lasers have been proven to reduce the pain, swelling, and bacterial formation that can occur during dental procedures. Lasers also ensure a better cut than that of a scalpel, and they sterilize surface tissues when used to create gum flaps. Often times, using a laser during surgery eliminates the need for sutures following the procedure. Often described as the “workhorse” of dental lasers, the versatile DEKA UltraSpeed CO2 laser is an important development in laser dentistry. Extensive research has proven this laser’s wavelength to be one of the safest and most effective in dentistry today. The CO2 laser has been used in medicine for over 25 years and the DEKA UltraSpeed CO2 laser makes procedures virtually pain-free, speeds recovery, and improves dental procedures in general. The DEKA UltraSpeed CO2 laser is a leading tool in laser dentistry, and we are proud to offer it to our patients. A wide variety of laser dental procedures are provided in our office and include the following: periodontal disease treatment, gum reconturing, frenectomies, cold sore treatments, implant placements, removal of hyperplastic tissue. We are proud to offer in our office the latest technology available in X-ray technology. Schick technologies, Inc. has developed Computerized Dental Radiography (CDR) which allows us to take fantastic computerized x-rays of your mouth with 90% less radiation than convential/traditional x-rays! Digital x-rays taken are therefore safer, faster, and provide excellent diagnostic capabilities to allow us to identify potential dental problems before they develop into costly and painful dental emergencies. Traditional dentistry had been based on the patient listening to what recommendations are being made to them by their dentist. We are proud to offer patients the opportunity to view potential dental conditions in their own mouth with the use of our intra-oral camera. This tool makes it much easier to understand what is happening in your mouth if you can see the problem on a computer monitor. 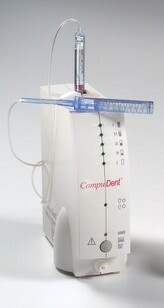 The intra-oral camera is an excellent tool used to communicate visually with patients the condition(s) of their mouth. We are proud to offer patients a revolutionary new device which was introduced to the dental profession in December of 1997 called the Wand™. The heart of this device is an on-board microprocessor, which guides the anesthetic flow rate. The microprocessor inside the Wand™ automatically compensates for different tissue densities and the anesthetic itself is delivered at a constant pressure and volume so that the injection itself is hardly felt. The unit additionally provides a flow of anesthetic directly ahead of the needle creating a "pathway of anesthesia" to further decrease the uncomfortable feeling usually associated with a dental injection. The source of discomfort for most injections, isn’t the needle – it’s the flow of anesthetic into the tissue in your mouth. The Wand™ allows for an optimal flow rate every single time so that the injection process can be more comfortable.